2-room apartment 70 m2, on the ground floor. Partly renovated in 2015, simple and cosy furnishings: living room with cable TV and radio. Exit to the terrace. 1 double bedroom with 1 double bed (2 x 90 cm, length 210 cm). Kitchen (3 hot plates, oven, microwave, electric coffee machine). Bath/WC. Terrace 10 m2. Beautiful view of Matterhorn. Facilities: Internet (WiFi, free). Please note: non-smokers only. Elevator to the large small apartment house Dianthus, 5 storeys. 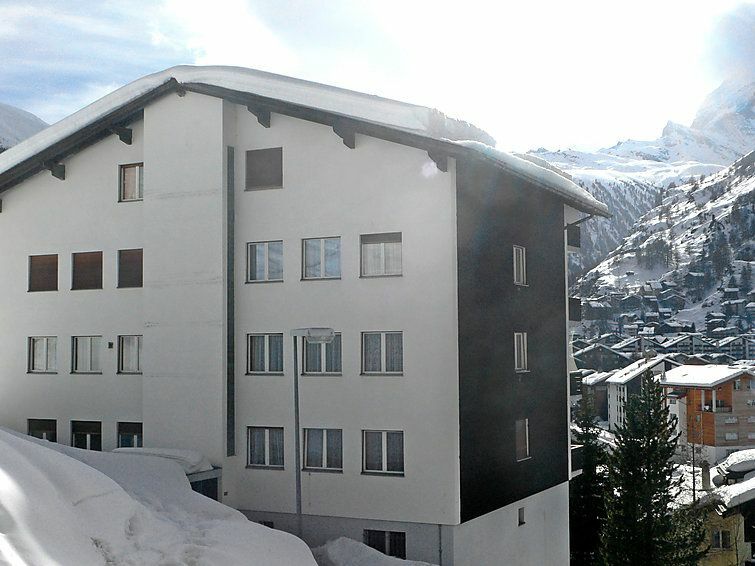 In the district of Wiesti 650 m from the centre of Zermatt, in a quiet, sunny, elevated position on a slope. In the house: storage room for skis, central heating system. Motor access to 150 m from the house. 100 m stepped path (52 steps) to the house. Supermarket 450 m, restaurant 550 m, bakery 650 m, 20 minute walk to the centre, bus stop Spiss 150 m, railway station Bahnhof Zermatt 650 m. Mountain railway, ski rental 650 m, ski bus stop 150 m, ski school 1 km, children's ski school 1 km. Please note: no lift. Cabs cannot stop right in front of the house.